Sorry, this item is sold out. Have VintageDoor make something just for you, or try these other items. Dark Linen Crochet Edge Double Fold Bias Tape (No. L2). Linen Crochet Bias. Brown Crochet Bias. 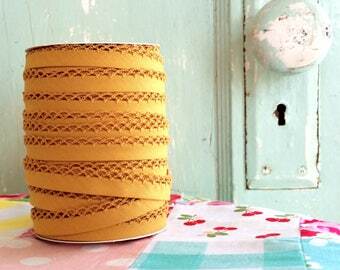 Tan Crochet Edge Bias Tape. Fuschia Floral Crochet Edge Double Fold Bias Tape (No. 62). Pink Floral Fabric. Pink Calico. Pink and Green. Pink and Green Floral. Sage Green Crochet Edge Double Fold Bias Tape (No. 30). Green Bias Tape. Moss or Sage Quilt Binding. Coral Polka Dot Crochet Edge Bias Tape (No. 1) for Children's Clothing. Double Fold Bias. Sewing Supplies.